Dubai: Following the introduction of a new number plate design last year, the Roads and Transport Authority (RTA) has now kicked off a campaign urging all motorists to upgrade to the new plates, ahead of mandatory upgrades from July for select codes. The upgrade is currently available for all types of distinguished and special number plates across all codes, and from May it will also be available optionally for unowned (allotted randomly through vehicle registration) plates. 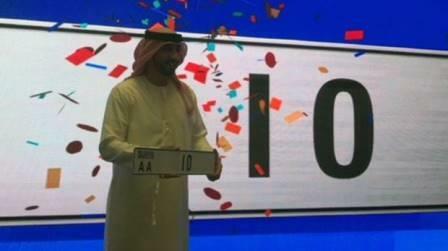 According to RTA, over the next couple of years, all categories of vehicle number plates will have to be replaced. As the RTA presses ahead with its new plates regime, unowned car plates with codes A, B and C will be among the first to be up for mandatory replacement from July. The new number plate design that includes either a black and white or colour Dubai logo, depending on the amount you pay, was launched last year after the introduction of double codes necessitated a redesign. “The RTA has developed a new strategy for number plates resulting in a new generation of number plates with double codes. This has accordingly resulted in the whole design for the number plates to be changed to adopt the single and double codes with the same design language,” said Sultan Al Marzouqi, director of RTA’s Vehicle Licensing. The double codes are being introduced as the RTA is running out of single codes, as the number of vehicles continues to rise at an alarming rate in Dubai. According to RTA, over the next couple of years, all categories of vehicle number plates — whether purchased online, bought in an auction or allotted through the vehicle registration process — will have to be replaced in phases. In the next phase, beginning January next year, plates with codes D, E, F, G, H and I will have to be replaced, while in January 2020 replacement for codes J, K, L, M, N and O will start and following that in January 2021, it will be the turn of all unowned plates with codes P to Z as well as other types of plates. Depending on the size of the plates and colour of the logo, the prices of the plates vary. A regular short number plate with a black and white logo will cost Dh35, while a long number plate in the same category will cost Dh50. For those who already own number plates with colour logo of Dubai, the replacement for the long and short plates will cost Dh35 and Dh50, respectively, while those who want to buy a new plate with coloured Dubai logo will have to pay Dh400 irrespective of the plate’s size. As for the distinguished or special number plates, the replacement will cost Dh500, with the process to be completed mandatorily by the end of this year. Al Marzouqi said motorists with owned number plates willing to get the plates replaced can either proceed immediately to any of the RTA-affiliated vehicle testing and registration centres or get it replaced at the time of their scheduled renewal, while those with unowned number plates can wait till May to do the same. However, many motorists seem unimpressed with going through the hassle of replacing the number plates, especially those who had recently got the new ones. “I recently got my number plate replaced with the one with Dubai’s colour logo and I will have to do it again and pay more in the process, this is unacceptable,” said Mohammad Akram, a Dubai resident. Another motorist said that with the registration and testing fees also hiked, this is an additional burden. “We are already paying extra for so many things. There is an increased registration and testing fee, plus fines, knowledge and innovation fees and now the number plate replacement. And then they will charge for the installation of the number plate. I think this is totally unnecessary,” said Saeed Fakri, another expatriate.